Ishizu joined Speed Duel in the Starter Deck: Destiny Masters with the power of Gravekeepers, and this set has some new tools to support them in their sacred duty. The main tool of course being Ishizu’s brand new Skill to bolster their power! Legendary Duelists: Sisters of the Rose introduces brand-new cards inspired by some of Dueling’s most daring strategies from the pantheon of Yu-Gi-Oh! manga and anime series. Whether you want to power a single monster up to stratospheric proportions, create an inhospitable field environment that makes monsters wish they’d never been Summoned, or just endlessly duplicate your favorite monster, you’ll have something to look forward to this winter! 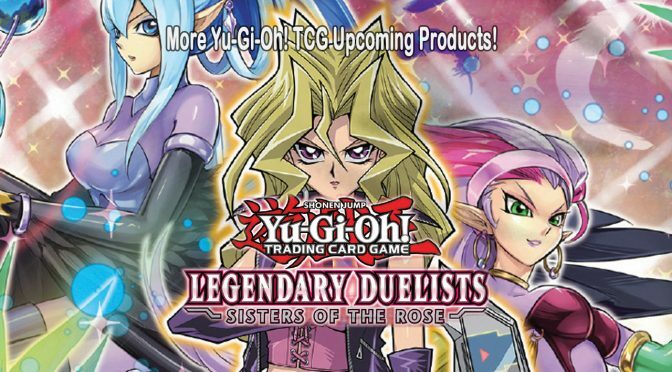 Legendary Duelists: Sisters of the Rose debuts brand-new cards inspired by past heroines of Yu-Gi-Oh! like Mai Valentine and Akiza Izinski. Mai is making her second appearance in the Legendary Duelists series with brand-new cards for her Harpie Lady strategy from the Duelist Kingdom tournament. Mai’s strategy was all about duplicating Harpies with Elegant Egotist to Summon Harpie Lady Sisters, and Legendary Duelists: Sisters of the Rose has brand-new cards to help you multiply your Harpies and reward you for playing with the classic Harpie Lady Sisters card! Konami Digital Entertainment will release Arena of Lost Souls, the first booster for its Yu-Gi-Oh! TCG Speed Duel on March 29. The Speed Dueling format for Yu-Gi-Oh! will launch on January 25 (see “New Details, Pic for ‘Yu-Gi-Oh!’ Speed Dueling Launch”). Speed Duel – Arena of Lost Souls adds 50 new cards : 45 new-to-Speed Duel cards and 5 Skill cards. The booster includes 34 Commons, 8 Super Rares, and 8 Ultra Rares. Yugi gets a new Skill that allows him to harness the Royal Knights. Ishizu will get a new Skill and some new tools to support the Gravekeeper’s strategy. A new character will also be introduced in this booster – Bonz – the original master of Zombies. He will add 3 new Skill cards to harness his strategy. New ‘Lost Art Promotion’ from Yu-Gi-Oh! Konami will be offering a new Lost Art Promotion next year to give players a chance to get a half dozen cards with artwork never before available outside of Asia. Like the 2018 Lost Art Promotion (see “‘Yu-Gi-Oh!’ ‘Lost Art Promotion’”), a different Lost Art card will be available each month, only through Official Tournament Stores. To be eligible, customers must purchase at least $30 worth of sealed Yu-Gi-Oh! TCG products, which will award them one free Lost Art Promotion card. This is the first time that these cards will be made available to the rest of the world with the original Asian art. The promotion will kick off with Ring of Destruction in January. Supplies of the Lost Art Promotion cards will be limited, and they will be available only while supplies last. Konami Digital Entertainment has shared information on the upcoming Savage Strike releases for its Yu-Gi-Oh! Trading Card Game, as well as revealing more details on Soul Fusion Special Edition. Savage Strike will be the first booster of 2019, and it will power up Synchro Summoning strategies for duelists playing that type of deck. Synchro Summoning has already made an appearance in the latest Yu-Gi-Oh! anime VRAINS, and now the first Synchro Monsters will debut in this booster. Cards to power up Zombie Synchro and Neos Decks are also included. The 100-card booster includes 48 Commons, 20 Rares, 14 Super Rares, 10 Ultra Rares, and 8 Secret Rares. Release is planned for February 1. Savage Strike Special Edition will include 3 Savage Strike Booster Packs as well as 1 of 2 Super Rare variant cards, and 1 of 2 Super Rare preview cards of non-foil cards from an upcoming booster set. Release is set for March 8. Yu-Gi-Oh! Soul Fusion Special Edition was announced this summer (see “Fusion Summoning Heats Up with New ‘Yu-Gi-Oh!’ Booster”), and as the December 7 release approaches, the company has announced the two Super Rare variant cards which will be in the package. Players will pull either Summon Sorceress or Isolde, Two Tales of the Noble Knights. The two Super Rare preview cards from the upcoming Savage Strike Booster Set will be Prank-Kids Rocksies and Neo Space Connector. Konami Digital Entertainment has unveiled images and details for its Yu-Gi-Oh! 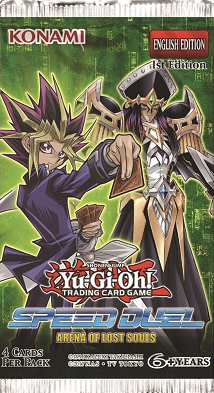 Trading Card Game Golden Duelist Collection Accessories releasing on February 15. Each of the products will feature gleaming gold and a unique glittering foil while showcasing the iconic cards from the TCG. The Golden Duelist Collection Duelist Portfolio will include 10 9-pocket pages, allowing players to display up to 180 cards. The Golden Duelist Collection Card Case can fit a full Main, Side, and Extra Deck (total 70 sleeved cards) and includes a special divider. 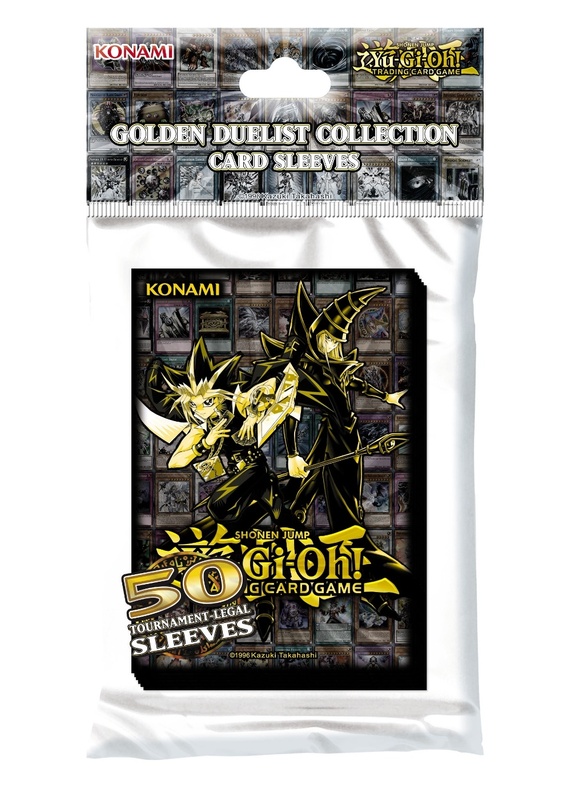 The Golden Duelist Collection Card Sleeves Packs will contain 50 sleeves that meet Yu-Gi-Oh!’s tournament regulation standards. The Golden Duelist Collection Game mat is a rubber mat that is the same size as the Game Mats used as prizes in various Yu-Gi-Oh! sanctioned events.